Made of Durable Cotton Canvas and measures 47.2"x47.2"x55.1" All seams, raw fabric edges and openings are reinforced for your Child's Safety, Durability and Years of Play. Wooden poles are sanded to prevent splinters This adorable Teepee is a PERFECT Birthday Present for a Little Boy or a Little Girl. It works Great for kid's Sleepover Parties, or a Play House for luxury Playroom Decor. We Guarantee It! If for any reason your Little One does not think "It's The Best Present Ever", our American Customer Service Fairies will take it back, no questions asked. 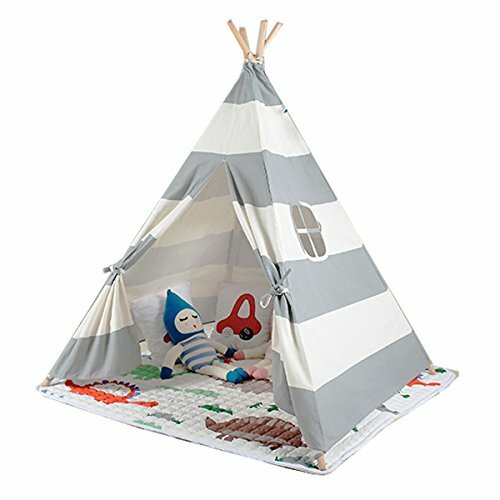 Comes with carrycase and measures 47.2"x47.2"x55.1"
This adorable Teepee is a PERFECT Birthday Present for a Little Boy or a Little Girl. It works Great for kid's Sleepover Parties, or a Play House for luxury Playroom Decor. We Guarantee It! If for any reason your Little One does not think "It's The Best Present Ever", our American Customer Service Fairies will take it back, no questions asked. If you have any questions about this product by FREE LOVE, contact us by completing and submitting the form below. If you are looking for a specif part number, please include it with your message.